Hwy 101 mile marker 166. 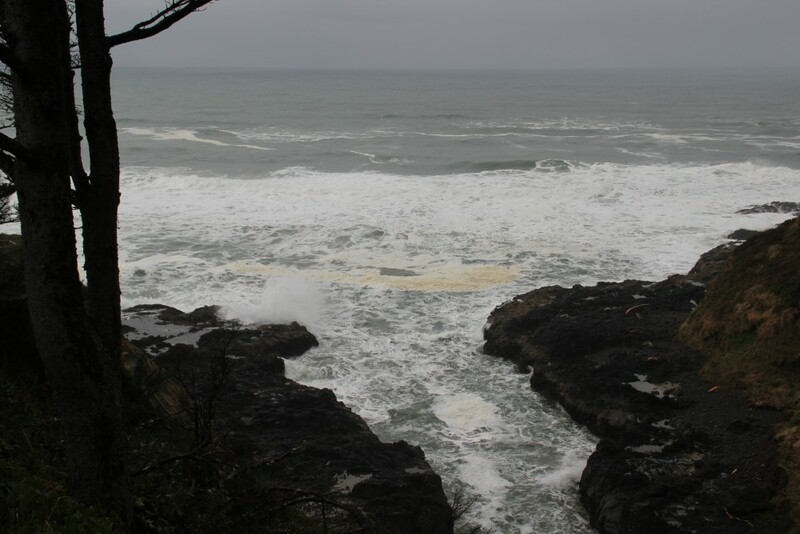 The Devil's Churn is an inlet of the Pacific which generates some interesting wave action. The inlet can be viewed from above, in a parking lot which has an interpretitive building. But if you really want to see the wave action up close, take the walkway down to the rocks below. Down at the bottom, the "churn" itself is interesting, but it gets much better if you walk out to the rocks that jut out near the chasm's entrance. Note that this is not entirely safe if the seas are higher than 10 ft! There is also a small sandwich and coffee shop whose proprietor can make some delicious sandwiches. Site Resources: Staffed Visitor's Center, sandwich/coffee shop, restroom. U.S.F.S. 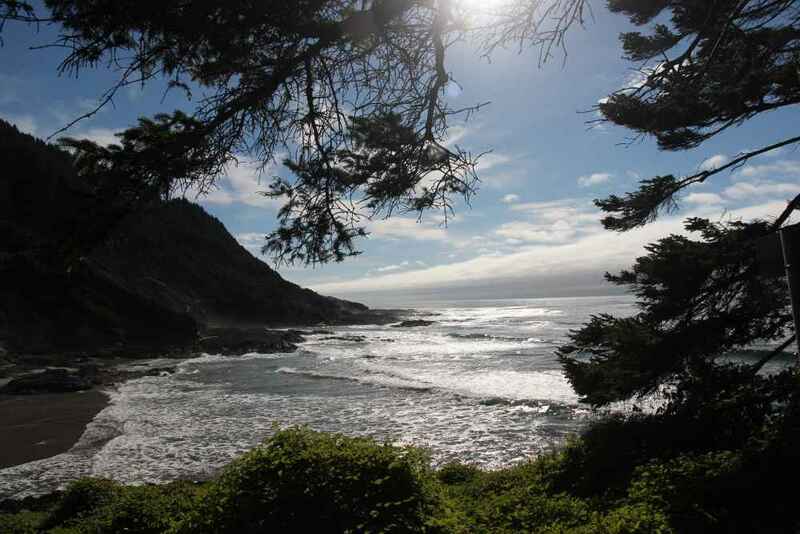 link to Cape Perpetua area (contains Devil's Churn):Devil's Churn No fee required. This is the inlet itself, viewed from above. This is on a stormy February day. A trail with numerous stairs leads down to the rocks on the South side of the inlet. This view is looking North over the inlet. Needless to say, we didn't take this on that same stormy day in February! 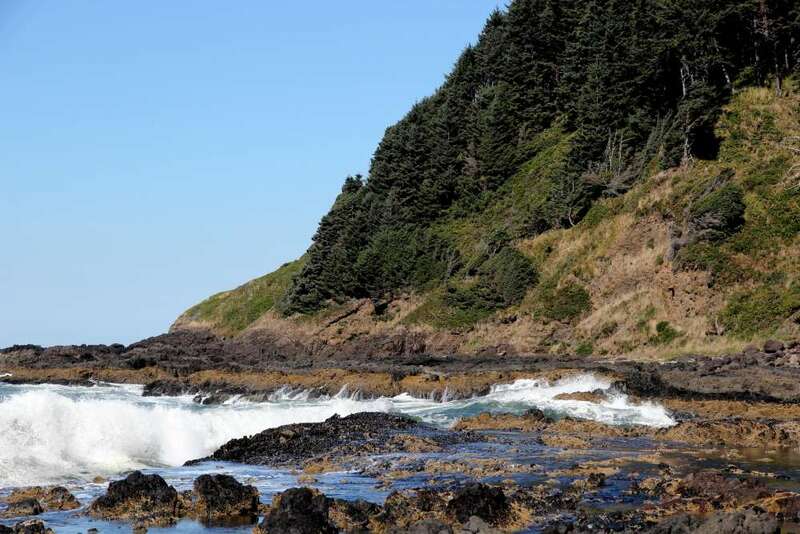 There is a trail leading to Cape Perpetua to the South. It winds around the headlands and passes right next to Hwy 101 at one point. This is the scene just after you leave Devil's Churn area.